Provide comfort for the family of Sandra Bohrer with a meaningful gesture of sympathy. 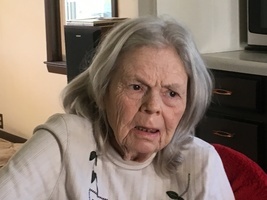 Bohrer, Sandra L. (74) - Passed away in Dayton on January 8th, 2019. Sandy was predeceased by her husband Donald, and is survived by her 3 sons: Donald, Duane & Darrel. She will be missed my her many grandchildren and remembered by her family and friends. To send flowers in memory of Sandra L Bohrer (Jones), please visit our Heartfelt Sympathies Store. Provide comfort for the family of Sandra L Bohrer (Jones) by sending flowers. Please accept my condolences. Nothing compares to the death of one close to our hearts. Jesus became grieved and gave way to tears at the death of his friend Lazarus and seeing the anguish of those close to him. He stated that Lazarus was sleeping. He resurrected him back to life and has promised a resurrection in the near future in which others will be awakened from death. John 5:28,29 states, "Do not be amazed at this, for the hour is coming in which all those in the memorial tombs will hear his voice and come out...Knowing there's hope even for those you've lost in death can give you needed strength in the days ahead.